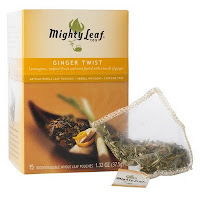 I love Mighty Leaf tea. And, I’m not ashamed to admit that I initially fell in love with it because of the silk pouch. It just looks so luxurious. However, after trying several varieties, I know it is more than just appearance…this is great tea! My new favorite flavor is the Ginger Twist. I like it with a bit of honey, but my co-workers tell me it is good enough to drink without adding anything to it.